I was very privileged to accompany our Special Olympics athletes on their trip to Wellington and West Palm Beach. It was amazing to see how quickly they adapted to American customs which are often very different to the customs in Haiti. Darline, the group’s Ambassador, was a true leader in every sense of the word. When the others were nervous before flying, she had them smiling and was telling them about all of the amazing things they would see and the yummy new food they would taste. Verlanta sang and smiled throughout the trip. At every opportunity she danced! Max’s* big smile broke hearts and he prayed that we would have a safe trip during every trip we made. Philemon* was like a true big brother to Max, helping him along, carrying his backpack and giving him little hints. Ketia was truly amazed by everything and everyone. She loved meeting and chatting to all the Haitians we met on the trip. She wanted to learn everything about their lives in the U.S.
We are very fortunate to be able to train and ride the horses from Vinceremos Therapeutic Riding Centre each year. The Haitian trainers who came along also get the benefit of receiving specialized training from the team in Vinceremos and we then see their skills improve on return. Our athletes proudly represented Haiti, all coming home with ribbons and setting inspirational goals for all of our younger riders at Kay St. Helene and Kay St. Germaine Special Needs Programs. A great big debt of gratitude is owed to the entire team at Kay Christine and Kay St. Germaine for all of the training and preparation which goes into every trip. While a big thank you should also go to the trainers and carers who accompanied the athletes on the trip, without whom it would not have been possible. These trips are an extension of the rehabilitation program which sees an average of 30 children from Kay Germaine and they receive equine therapy every week. 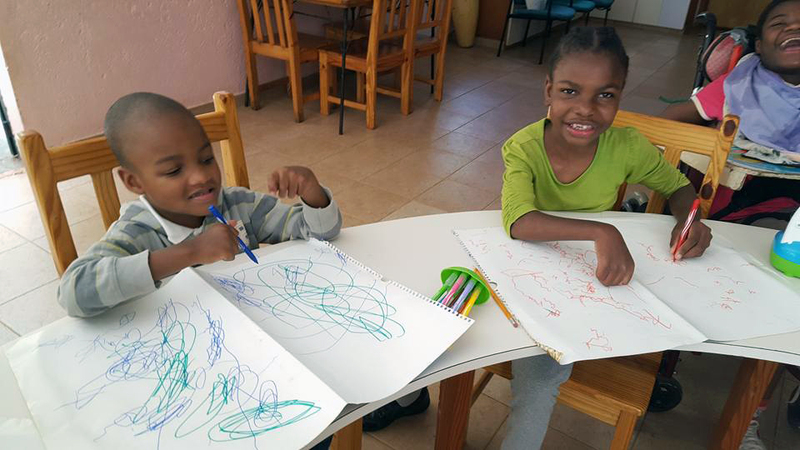 The program also caters for 25-30 children from St. Helene Orphanage in Kenscoff. Over the period of a year, this results in a total of 122 students receiving some form of equine therapy at Chateu-Blond stables in Tabarre, Haiti. Equine therapy improves balance and assists in the strengthening of the child’s core, the improvement of motor skills and increased respiratory control. For those who have more severe conditions and are confined to a wheelchair, touching and being near horses can have positive effects. With these children, studies have shown that equine therapy improves sensory integration and the understanding of visual cues. *Alias names used to protect privacy of minors. Thursday, December 3rd was a great day to be in Kay Ste. Germaine as we celebrated International Day for People with Disabilities. In Kay Christine at our home in Kenscoff, the children were up way before day break as we got them ready for their annual trip down to Kay Ste. Germaine, located in Tabarre. Such excitement in the house! By 6.30 am we were all on our way – quite the convoy, two big buses, one small bus and one small lorry (bringing the wheelchairs)! Mass was at 9 am and we had a huge crowd – kids from our special needs school, kids from our therapy program, kids from Kay Christine, kids from Ste. Helene, adults from our stroke program, parents, friends – we were full! After Mass the children and adults entertained us and showed us just how much they can do. Everyone was delighted to perform and what a joy it was to be a part of it all! The day was a great success and living proof of all that we can do when we work together and put our trust in God. Have a look at some of the photos. lips sealed up forever, arms strapped real tight. they are silently sleeping the sleep of the dead. my mind is distracted, by the loss of dreams. for each adult corpse there is a struggle in vain. it’s not so hard really- I know the reasons why. now painfully butchered by Poverty’s Knife. they rule with dominion – no escape from them here. on the floor of our chapel -strangers become alike. And what of this Advent and the special infant child? Do we dare believe this story, do we dare become beguiled? Do we dare to imagine, a life filled with love? a time with no bodies on the floor, a world filled with peace from above? Do we dare to imagine a world without war and tears? where we care for each other, where love conquers fears? And wasn’t the infant Jesus himself born into strife? didn’t he come to be among us to show another way of life. We have to love one another – everyone from far and near. how can we accept this reality? Surely we must do more? find more people to help us, somehow, somewhere. I cling to this dream of peace – for a future I might not live to see. we must fight the forces of evil that come disguised in greed. their days on this earth are ended, forever gone from our sight. Too many silent bodies lying daily on the floor. At the beginning of each month the teachers have a one day formation with the aim to increase their skills and enhance the learning experience for the children in Kay Germaine and Larche (Kenscoff). Presenting this month’s formation was Casandra (Language & Communication Technician) and Jacinta (Special Ed. Trainer) who focused their formations on enhancing communication techniques for our students who find it difficult to communicate, and first aid and general safety in the school. Back to school for the teachers and assistants for a full week of training before school resumes next week. Teacher and classroom assistants trying out the new playground and learning how their students will be able to participate in all of the physical education activities. With a sad and heavy heart we watched our beloved Olsen Signifils leave us yesterday at St. Damien Hospital. We had been there for 2.5 weeks and despite the best efforts of everyone, we could not keep him with us this time. So many times in the past, Olsen had cheated death, but this time God called him home. His mission was complete. Olsen was abandoned in 2001 at St. Damien as a baby and shortly afterwards we welcomed him to Kay Christine, our home at St. Helene. 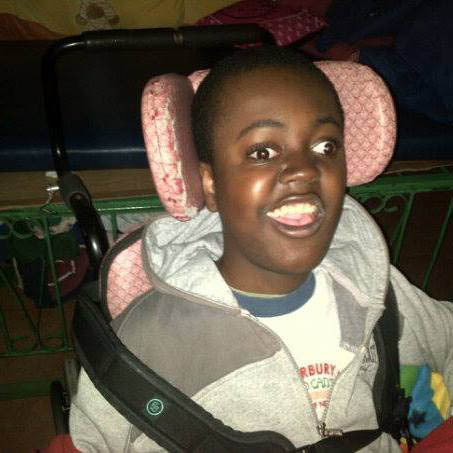 As a result of meningitis, he had developed severe brain damage and hydrocephalus. I will never forget seeing him for the first time in the hospital ward – a skinny, crying, blind child with a huge head! From the first evening in Kay Christine, it was clear to me that this boy was going to thrive with us. During the night prayer I noticed how he was listening intently, especially during the singing. And thrive he did. In September 2001, we brought him to Amarillo, Texas, where he had a shunt put in and after that Olsen enjoyed several years of good health. Olsen was a huge presence in Kay Christine. For the last 14 months he had been amazingly well. First thing in the morning we would wake up to the sound of Olsen singing and making his happy noises. Frequently he was the last to go to sleep and he was busy laughing and singing in his bed. He loved to be kissed and he learned to give kisses to everyone. You just had to say, “Olsen give me a kiss,” and you got it. I would write forever about this beautiful young man that enriched our lives. We all have a time to leave this life and yesterday was to be his time. He had a bad infection in his brain and there was nothing we could do this time. He bore his suffering very bravely and it was very hard to see him suffer. In the end, God sent his angels to bring him home. We thank God for his life and for his presence in our family. When he was a baby the doctors thought he would not live long. When he became very ill a few years ago, the doctors said there was no hope for him. In April we celebrated his 15th birthday. He was a child of God and we know that somehwhere in the next life he is singing “e i e i o”. Every day here he used to sing Jwayez anivese – Happy Birthday, so I can only imagine how happy he will be singing this in heaven to all the hosts of angels – many of them our own Kay Christine kids. Please include the eternal rest of Olsen and our NPH Haiti family in your prayers.